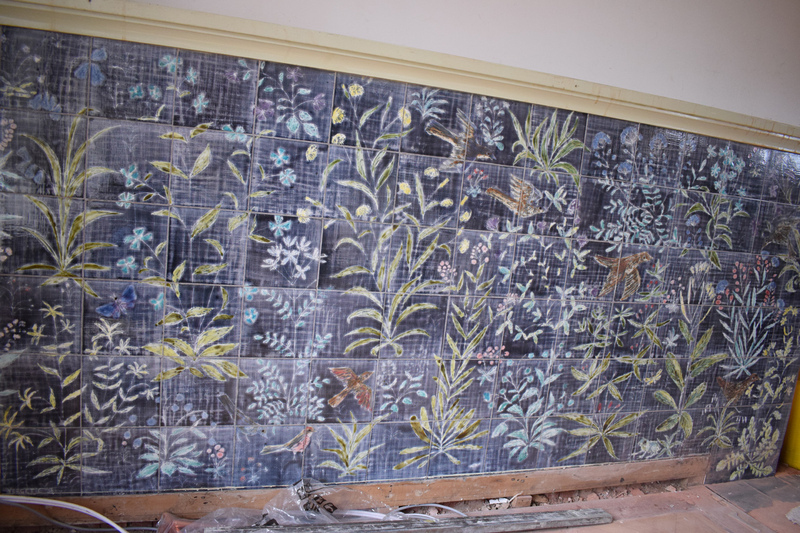 I posted earlier about the discovery under a false wall of tile panels by Nicholas Vergette. I went to see them recently and was bowled over: they are interesting and a beautiful thing to have in a house. One panel decorates a chimney breast, another the lower half of a wall in a sitting room. They are signed “Vergette” and although there are no documentary records I have no doubt that they are by him. 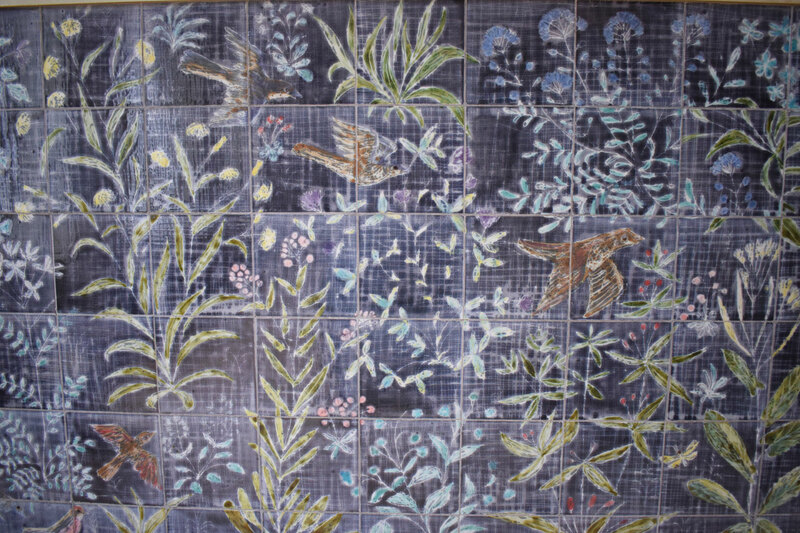 The first panel, dated 1955, is of stoneware tiles, which were probably made by Vergette himself, glazed in a silk-matt white glaze and decorated in a shiny blue glaze applied over wax resist and with marks scratched through (above). 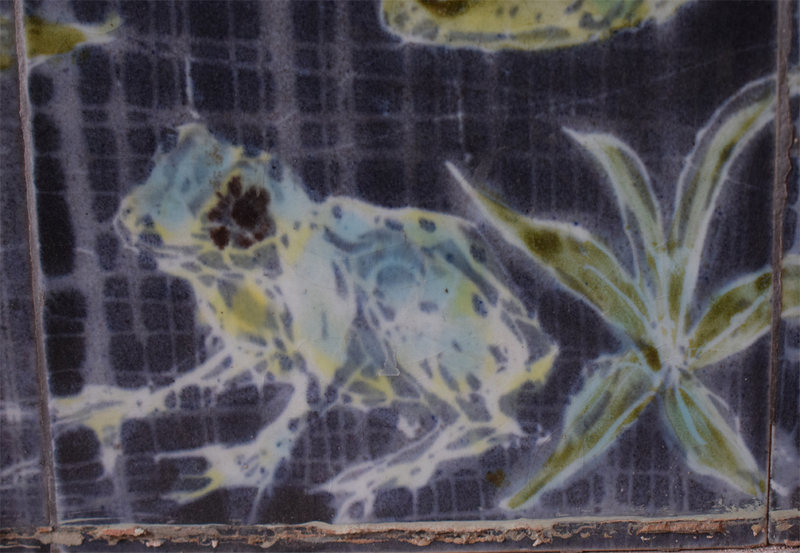 Vergette often used wax resist and sgraffito on his ceramics and the blue-and-white colourway is characteristic of his work of this period. The floral design is free and asymmetrical and well scaled for the chimney breast and the small room it is in. The second, dated 1956, is in some ways more remarkable. It is large, comprising 189 six-inch tiles. It has an eight-colour design with a deep violet and blue-grey background and with floral and animal motifs in royal blue, sky blue, olive green, primrose yellow, brown and red. The background, with the violet cross hatched to reveal grey lines, is original. Vergette painted the motifs first, then covered them in wax and then washed in the dark background. Today we have water-soluble wax emulsion to get resist effects, but Vergette would have used hot candle wax, which is difficult to control and produces noxious fumes – I stopped using it after I almost passed out in my studio. Vergette’s panel is painted on tiles made by Johnson’s of Stoke-on-Trent, probably bought unglazed and then covered by him in a tin glaze and decorated using the maiolica technique. He may have decided at this stage that manufacturing his own tiles was too difficult and that it was best left to a specialist – tile making takes up a lot of space and the problems of warping and estimating shrinkage are considerable. 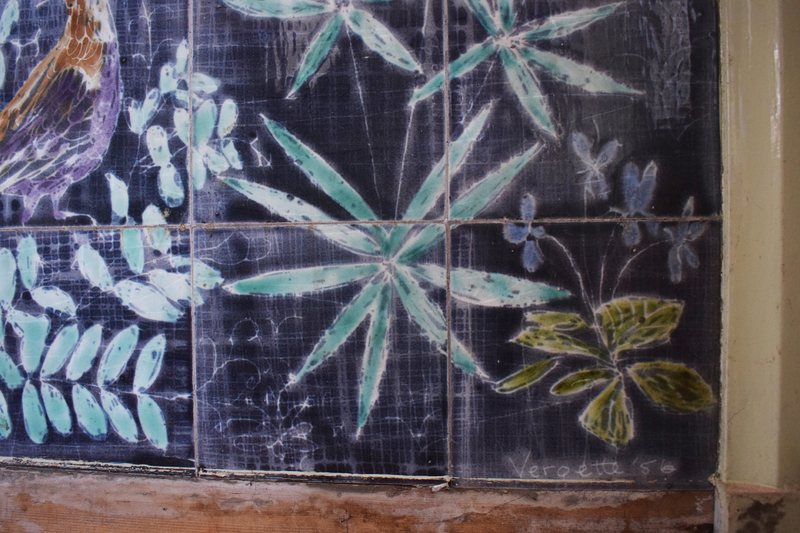 To decorate the tiles, Vergette would have laid them in position on the floor and painted them, then numbered them, fired them and later re-assembled them on site. 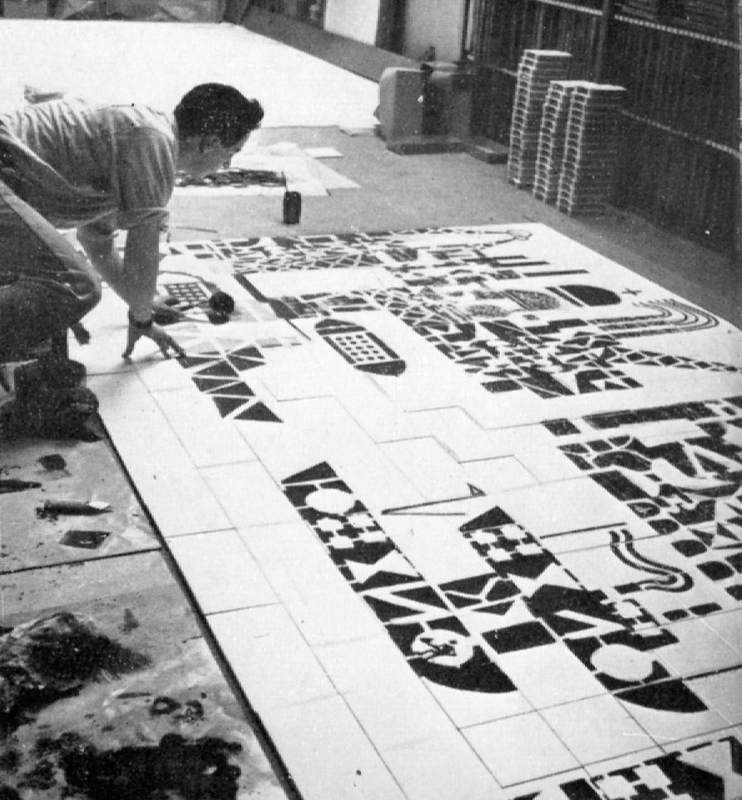 This way of decorating was illustrated by Kenneth Clark, a contemporary of Vergette, in his book “Practical Pottery and Ceramics”, showing Tony Hollaway at work (below). 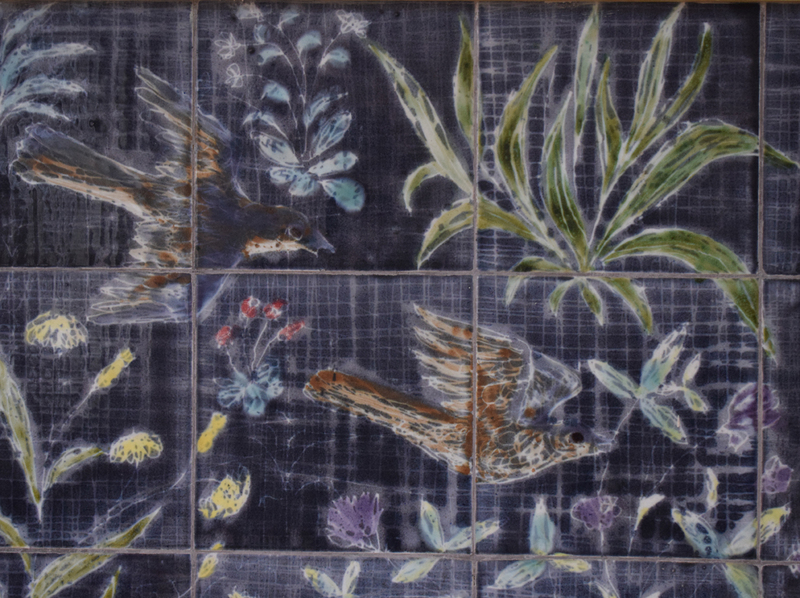 At the time he made these tiles (just before he went to America) Vergette was working with William Newland and Margaret Hine in a studio in Bayswater, where they received commissions to decorate the coffee bars that were springing up all over London. Vergette and Newland were also teaching at the Central School of Arts and Crafts. Newland thought that British troops advancing through Italy had developed a taste for good coffee and demanded it when they got home. The coffee bars were certainly part of the Italian wave of the ‘fifties, with Gaggia machines, names like “Moka Ris” and openings by Gina Lollobrigida. 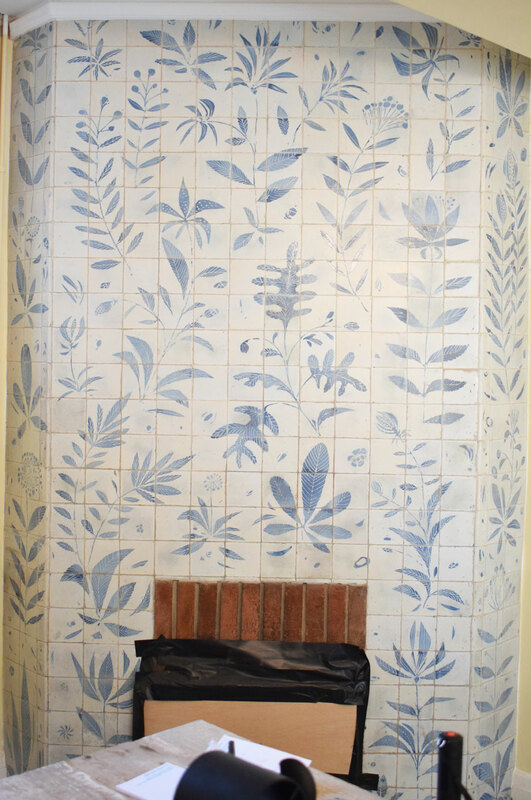 The maiolica plates and tiles designed by the Bayswater three enhanced their Mediterranean feel. Newland observed that coffee bars gave young people for the first time somewhere to sit indoors without supervision, without having to drink alcohol and without having to spend a lot of money. By the late 1950s, youth fashion was also Italian-influenced. 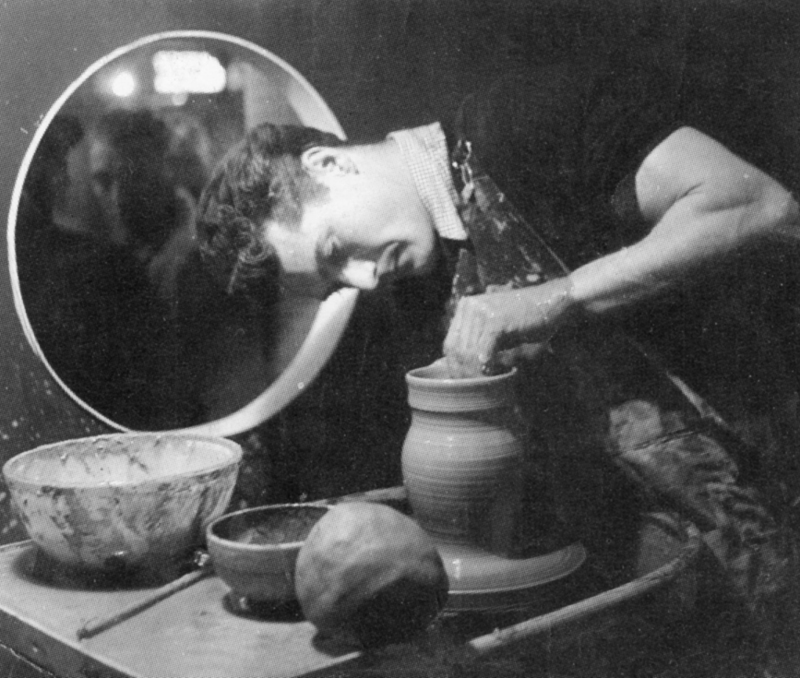 Nicholas Vergette demonstrating at the Ceramics in the Home exhibition in 1952. Dora Billington, under whom Vergette worked at the Central School of Arts and Crafts, said in“The New Look in British Pottery” that his work, “though much of it is in the round, somehow suggests a painter’s approach. His best work is evocative, always suggesting more than is actually stated. … it is good to see him turning seriously to tiles.” Billington illustrates a contemporary tile panel, but its present whereabouts are unknown, if it still exists. Nearly all the decorations made by Vergette and his colleagues are lost or destroyed, and if he ever made any tile panels for coffee bars they no longer exist, so these recently discovered panels are outstanding as the only surviving example of tile work by him. The fact that the polychrome tiles were covered up indicates that they weren’t much valued, and it’s fortunate that they weren’t hacked off. The details of the commission are unknown, but there is a clue in two artists associated with the Central School who lived near the house, Newland and the illustrator Val Biro. They may have introduced the owner to Vergette. 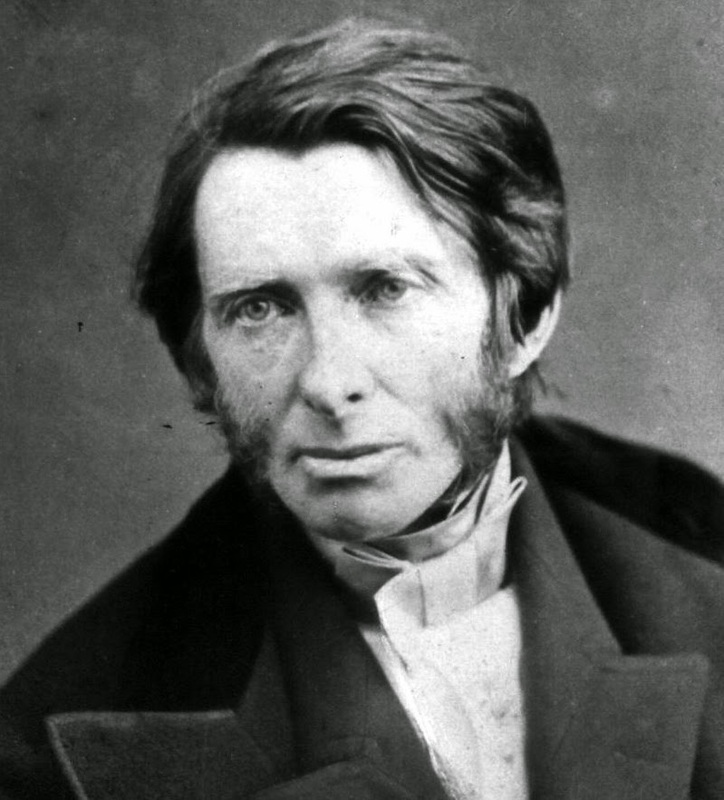 John Ruskin: Workmen must be free to produce imperfect art. Studio pottery was created partly by narratives that set out its history, listed its key figures and promoted its values. Bernard Leach, the father of British studio pottery, was its leading narrator, but his admirers also played an important part. Muriel Rose’s book Artist Potters in England (1954) was a short text but was highly influential, not least in its omissions. In fact, she omitted nearly every artist potter in England. 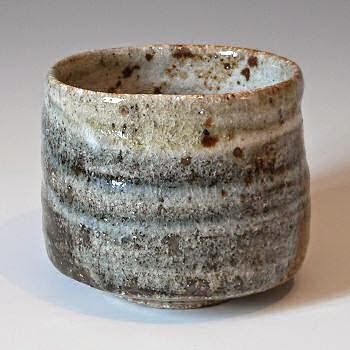 She highlighted Leach, Shoji Hamada, Michael Cardew, Nora Braden, Katherine Pleydell Bouverie, William Staite Murray, Sam Haile, Henry Hammond, Lucie Rie and Hans Coper and her book created the canon of studio pottery. But she omitted all the figurative ceramists (like Charles and Nell Vyse, Stella Crofts and Gwendoline Parnell) and all those who excelled at decoration (like Bernard Moore, Alfred Powell and Louise Powell). The history of art pottery until about 1930 was, in fact, mainly the history of figurative and decorated pottery, and it was only from the 1930s that the stoneware of Leach and Staite Murray, based on form and the texture of high temperature feldspathic glazes, began to define British art pottery. In constructing her narrative, Rose chose only those who were seen to prefigure her chosen subject and simply disregarded everyone else. Although she wrote when decorated tin-glazed studio pottery was at its most popular, she ignored that as well, making no mention of those who did it best: William Newland, Margaret Hine, Nicholas Vergette and James Tower – those who created what Dora Billington called “The New Look in British Pottery”. By these omissions certain values were asserted: Pottery should be designed and made by the same person, or by a few people. It should be made in a workshop with little power-driven machinery. It should be formed on the potter’s wheel, preferably from clay dug and prepared hand. The studio of an educated, middle class potter should be run with an eye on the unsophisticated maker of flowerpots and his counterpart in Japan. Art pottery should comprise useful vessels, usually round and usually brown or grey. (Their usefulness was not finely calibrated and there were anachronisms like cider jars and oddities like wine goblets.) It should be rough and quickly made, often with a gritty base that would sit well on scrubbed pine but not on polished mahogany. The values were those of high minded simple living. The physical difficulties of this way of making were thought to make better potters as well as better pots. A jug from the Leach Pottery: not on the polished table, please. Oliver Watson described this sort of pottery as “the ethical pot”. 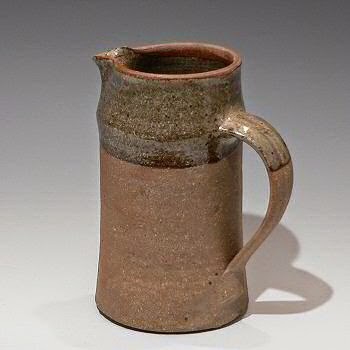 Watson, who was head of Ceramics at the Victoria and Albert Museum from 1979 to 2005, was one of the first to write objectively about studio pottery and to distance himself from its dogmas. His account of studio pottery, based on the V&A’s collection, is the most lucid and perceptive introduction to the subject. More recently, Jeffrey Jones, at the University of Cardiff, has written a longer text, which locates studio pottery in its artistic and intellectual context, referring to its dialogue with modernism. These critical narratives of studio pottery emerged as its practices became more varied and dextrous. J.M.Keynes said that “Practical men, who believe themselves to be quite exempt from any intellectual influences, are usually slaves of some defunct economist.” In this context we can say that practical craftsmen were slaves of John Ruskin. He propounded the virtues of roughness in “The Nature of Gothic”. His ideas migrated to Japan and returned to England with Leach and Shoji Hamada in the 1920s. By the 1960s, every un-intellectual hippy potter embraced them without knowing it. “The Nature of Gothic” was a chapter in The Stones of Venice in which Ruskin asserted that all Gothic architecture had more or less of savageness, changefulness, naturalism, grotesqueness, rigidity and redundancy. It was from Ruskin’s doctrine of savageness that came the aesthetic of roughness in pottery and its association with social criticism. The savagery of this work was not merely the expression of landscape and climate but also indicated religious principle. In Gothic we find the Christian recognition of the value of every soul but also of its limitations in its Fallen state. In the execution of Gothic ornament the uneducated man, with all his shortcomings, has been allowed to do the best he can, without subjection to the direction of a higher intellect. As the expression of a free man, the work, for all its roughness and imperfection, has value. The contemporary mind, on the other hand, desires perfection and accuracy in work and is surrounded by highly finished artifacts. This high finish is the product of servile labour, for a workman can achieve it only if he is told exactly what to do. If he is given freedom he will err. The desire for a high degree of accuracy degrades the operative into a machine, and the systematic degradation of the worker in modern industry has generated destructive revolt and an outcry against wealth and nobility. The revolt is not the result of men’s being commanded by others but of their being turned into machines by the factory system with its division of labour and its demand for high finish. Never encourage the manufacture of any article not absolutely necessary, in the production of which Invention has no share. Never demand an exact finish for its own sake, but only for some practical or noble end. Never encourage imitation or copying of any kind, except for the sake of preserving records of great works. All work, except the manufacture of necessities, should be inventive, even work done by rough and uneducated men. We cannot expect an exact finish from uneducated men except under instruction, and that makes them slaves.When they are doing exact work, they cannot be inventive and when they are inventive they cannot do exact work. Society should accept their invention even if it is imperfect, and that means forgoing refinement. Ruskin’s persuasiveness comes from majestic rhetoric rather than from evidence, and for these odd assertions he produces no evidence at all. Observation suggests that the capacity to produce exact work is unrelated to education, inventiveness or satisfaction in employment. Uninventive people who do refined work may be happy to do it and may be proud of it, and much highly-finished work was done by independent artisans who invented their own designs. And, as David Pye observed in The Nature and Art of Workmanship, Ruskin exempted the manufacture of necessities from his principles of ennobling labour, which makes them irrelevant to most economic activity. “The Nature of Gothic” became, in effect, the manifesto of the Arts and Crafts movement and Ruskin’s ideas about the moral significance of art, his condemnation of industrial civilisation and his ideas of how goods should be produced shaped the romantic socialism of William Morris, Walter Crane, C.R.Ashbee and W.R.Lethaby. Yet no practical policies can be derived from it. 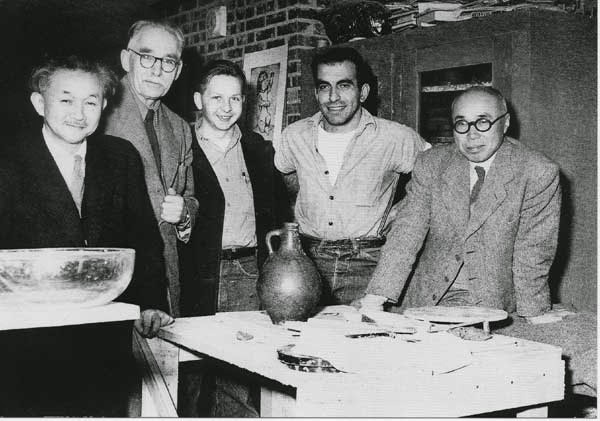 Rudy Autio, Peter Voulkos, and Shoji Hamada. Ruskin was read by Bernard Leach and his Japanese friends, notably by Soetsu Yanagi, the main begetter of Mingei, the Japanese folk craft movement. Yanagi had become concerned about the effects of industrialisation on Japanese life and tradition. It is said that Leach introduced him to Morris, from whom he found his way to Ruskin, although Ruskin had been read in Japan since the 1880s. Yanagi insisted that his ideas were original and that the concepts of Mingei were entirely Japanese, but he took much from Morris, including the ideas of the art of the common people, the value of ordinary household objects and the unknown craftsman, wedding them to the Zen idea of wabi-sabi, the aesthetic of modesty, naturalness, roughness, impermanence, sadness and imperfection. Mingei celebrated the commonplace, practical crafts of the people. Yanagi’s valorisation of the ordinary excluded expensive things or those made in very small numbers, which distinguished him from Ruskin, who wrote of cathedrals and gold, from Morris and Co., who made decorated furniture and tapestries for the rich, and even from the early studio potters, who exhibited in art galleries at high prices. Yanagi’s ideas about the sources of artistic inspiration and beauty are also subtly different from those of Morris and Ruskin: Morris and Ruskin valued the craftsman’s potential for conscious creativity, whose exercise gave him happiness in his work, while Yanagi spoke of divine power as the source of beauty; a recent critic, Idekawa Naoki, described Yanagi’s idea of the craftsman as that of a human machine creating beauty unconsciously through labour-intensive, repetitive work. Leach returned to England in 1920 wanting to unite the best of East and west. He acknowledged his debt to Ruskin: “I thought of Ruskin as my father,” he wrote. The ideas of Mingei were highlighted in the influential conference on the crafts at Dartington Hall in 1952 at which Leach, Yanagi and Hamada were key speakers. From Ruskin’s ideas on savagery, refracted through the Arts and Crafts movement, Mingei and Bernard Leach’s practice, came the cult of roughness in studio pottery. Leach’s practice followed almost to the letter Morris principals of pottery making, as laid out in his talk The Lesser Arts (1877): no moulds, no lathe-turning, no excessive neatness or mechanical finish, no printed decoration – and the customer must be prepared to pay a high price. Morris’s ideas about the avoidance of “mechanical finish” comes straight from Ruskin: that excessive neatness is something demanded by managers and that it demeans workers; but that “workmanlike finish” allows the worker to be an artist. “Mechanical finish” is similarly abhorred in the Leach school of pottery, which makes a virtue of roughness. And the high price confirms what Wallas said about the Arts-and-Crafts workman being unable to buy his own products. Savage beauty: a Japanese tea bowl by Lisa Hammond. Among current work done under the Ruskin//Mingei/Leach rubric I would single out for praise that of Lisa Hammond and Phil Rogers, which skilfully demonstrate wabi-sabi. But among lesser potters the cult of roughness can be and sometimes is used to justify incompetence and philistinism.David Pye argues that neither refined work nor rough work – in his terminology, “regulated” and “free” – is better than the other. He warns against spurious craftsmanship, which, in recognising that mass production can more easily produce regulated products than hand-making, “will take to a sort of travesty of rough workmanship: rough for the sake of roughness instead of rough for the sake of speed.” Rough work, says Pye, is produced when it has to be done quickly, but the good workman is always “trying to regulate the work in every way that care and dexterity will allow consistent with speed.”To aim for roughness, when it is not necessary, because the work does not have to be produced quickly, is playing at craft, like Marie Antoinette’s playing the peasant. Studio potters generally work slowly – they certainly throw on the wheel more slowly than the Stoke-on-Trent potters did – and they have no need to work quickly because they are producing works of art; therefore they have no need to make rough work. If the craftsman aims for perfection he can be sure that his work will be imperfect, but if he aims for imperfection it is likely to be bad.